Liberals deride “Eastern European racism” as a sign of post-Socialist backwardness, and incomplete Westernisation. This framing of the problem overlooks the fact xenophobia is encoded into the political economy of East-West relations, writes Maxim Edwards. Maxim Edwards is Commissioning Editor at openDemocracy Russia (oDR). He writes on memory, migration, minorities and nationalism, with a focus on Eastern Europe and the former Soviet Union. Once again, the Hungarian people are being asked their opinion of refugees. They’re being told it, too. Walking along Budapest’s streets and down its underpasses, a new series of government posters are striking in the boldness of their claims. “Tudta?” (did you know? ), they begin, reeling off statistics as alarming as they are dubious. Brussels will resettle “an entire city’s worth” of refugees to Hungary, shouts one. “More than three hundred people died in terrorist attacks across Europe since the start of the migration crisis”, cries another. Viktor Orbán’s government holds a referendum on 2 October, opposing the resettlement of 1,294 refugees across the country of 10 million. This is Hungary’s share, according to an EU resettlement plan, of 160,000 refugees — a small number considering that over a million entered the EU in 2015 alone. A 15 September telephone poll found that 73% of the population plans to vote “no”. Other billboards claim that sexual assaults have risen during the same period, and that “the Paris attack was committed by migrants”. The government has also sent leaflets urging Hungarian citizens to vote against the resettlement. Among its pages is a map of Europe; bright red stop signs indicate cities across northern Europe, from Brussels to Stockholm and Marseille. Apparently due to high concentrations of immigrants, these are “no-go areas”. Fears of a low turnout could easily turn around, given the ease with which ethnic Hungarians in neighbouring states can now vote in Budapest’s referendums and parliamentary elections. Usefully, the majority of them support the ruling Fidesz party. The opposition is divided on how to respond. For some, voting yes means participation — and legitimisation. Meanwhile, three opposition parties, Dialogue for Hungary, the Modern Hungary Movement and Together, have called for a boycott. Major liberal newspaper Nepszabadsag estimates the cost of the October referendum at 10 million Euros, probably a greater expense than the “threat” the government aims to counter. This is not dissimilar to Budapest’s other innovations over the past year. A “public consultation on immigration and terrorism” was announced in April 2015. Although only ten percent of the population responded, the government claimed rousing popular support for its policies. Budapest swiftly declared Serbia a safe third country, and proceeded to fence off the 175-kilometre border with its southern neighbour, at a cost at least 17 billion Forint. But this referendum poses more than loaded questions. One could spend months attempting to debunk the distortions and outright falsehoods peddled by the Hungarian government since the summer of 2015. I have no doubt that many academics and activists are doing just that. Following Orbán’s clash with media tycoon Lajos Simicska, government-friendly media is in an even stronger position to promote them (the fate of Népszabadság also hangs in the balance). This is a noble effort, but it misses the point. In the run-up to last year’s public consultation, the government erected billboards warning migrants “not to take the jobs of Hungarians” — in the Hungarian language. Their intended audience was not the desperate Afghans and Syrians staggering through the wheat-fields of southern Hungary. It was Hungarian citizens, or rather, their truthiness and received wisdom about refugees. In a recent poll, Pew found that 76 per cent of Hungarians believe that refugees will bring terrorism with them (the European median is 59%). In part, these fears could be a response to unfamiliarity with large-scale immigration from Africa or Asia, in comparison to former colonial powers in western Europe. But there are deeper, structural factors at play. Hungarian philosopher G.M. Tamás writes of a “competitive migration”, in which refugees from professional backgrounds are perceived by Hungarians as threatening the livelihood of their children and grandchildren working abroad. With 35 per cent of its citizens living under the poverty line and many youth working abroad, employment (and ensuing social stability) in Hungary are largely dependent on this European freedom of movement. Liberal commentators deride this “Eastern European racism” as a sign of post-Socialist backwardness, or an incomplete transition to European values. As I have written for openDemocracy, this framing of the problem overlooks a key fact. This xenophobia is encoded into the very political economy of East-West relations in Europe today. One could almost call it too European for comfort. A few days ago, Luxembourg foreign minister Asselborn called for Hungary to be expelled from the EU for grossly violating these same values. The Fidesz government has indeed hollowed out Hungarian democracy. This refugee crisis is the predictable result of European policy failures. After all, the “crisis” may be the European response. Budapest has been obstinate, a real obstacle in finding the solution. But it cannot be a scapegoat. Fortress Europe unites West and East, from the new fence at Calais, to the fortifications surrounding Spain’s enclaves in Morocco and the vigilante refugee hunters of Bulgaria. Brexit unease in Budapest is no less puzzling from this perspective. In a January meeting with David Cameron, Orbán stressed that Hungarians working in Britain should not be treated as “migrants”, but as “fellow Europeans”, a better class of alien enacting a legal right. In Brexit, the Hungarian government has lost a useful Eurosceptic ally; as Orbán put it in a full-page advertisement in the Daily Mail: “Hungary is proud to stand with you as a member of the European Union”. Rhetorically, the authorities have tried to turn the Brexit defeat to their advantage. Government spokesman Zoltán Kovács noted, with a pointed reference to Hungary’s forthcoming referendum, that the British vote demonstrated the “consequences” of Brussels ignoring “the people’s opinion”. Whatever that opinion, even Orbán has admitted that the referendum may not be binding. After the past travails of Hungarian democracy, why now the touching concern for the will of the electorate? There are many reasons, from Fidesz’s declining approval ratings to manufacturing consent for pre-approved policy goals. A lot must change in order for the union to survive — leaders of EU nations discuss Brussels’ crisis of legitimacy in Bratislava. Eurosceptic governments deride Brussels as unaccountable, undemocratic and — of course — cosmopolitan. Eurosceptic governments grudgingly pretend to empower their disillusioned electorates. The more meaningful choice is portrayed as the national community. The definition, as usual, is up to them. 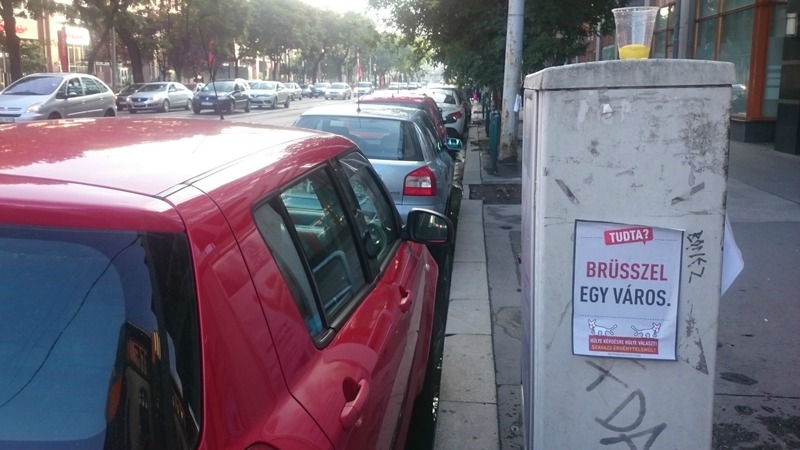 Luckily, there’s a competitor on the block in the run-up to 2 October: the Magyar Kétfarkú Kuta Part (Hungarian Two-Tailed Dog Party) has responded with a campaign of its own. The party was founded in 2006, but only registered in 2014. Today, their satire speaks to grim truths. “Come to Hungary!” read one of their billboards in 2015, “we’re all working in London anyway!”. This year, their posters mimic the government. “Did you know?”, they begin, “that more Hungarians have seen a UFO in their lifetime than a refugee?”, “that 98% of corruption cases involve politicians?”. Brandishing my camera, I took a stroll down Rákoczi street in search of further absurdity. Many people already have a hard time accepting immigrants who are not that much different from neighboring countries. This is reality and it is only dumb to totally ignore this basic feature of human nature and declare universal rights for everybody, coming from everywhere who manages to get here. It is dumb because you can see the backlash coming from miles and the backlash threatens to destroys the fragile cooperation on a European level. Europe is not the USA, people do not get persuaded by the same brainwashing about being a nations of immigrants. Nativism on a European scale is the only policy that can save the EU. Europe for Europeans, that is the only level that can maybe be reached, but if you open the floodgates of migration you will end up with each nation for itself. That is about the only thing you have written that I agree with. The white majority in the US is calling for border closure, very anti Muslim and Latino.